Trailer Sauce, your source for free trailer plans, advice and information for building your own trailer. Bryce is passionate about building car trailers. Having worked for a trailer manufacturer for many years, he has a wealth of knowledge and advice for DIY trailer builders. In fact he decided to fund and develop the website himself and provide plans, information and materials for free. If you do visit the website and want to support him, click on a suitable advert. Bryce is technically minded and knows how to build his own website. He wanted me to help provide a good self managed system and some design ideas. 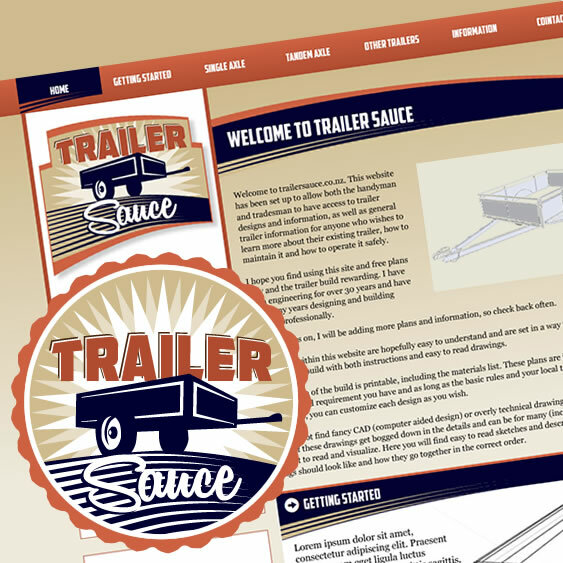 The brief was to create a sauce label or bottle cap design, then progress this onto a website theme. The system needed to be flexible with slots for adverts. Bryce has increased the level of "Spiciness" since this initial design prototype but the flavour is just as tasty.